Different versions for every need and budget. I had no idea how visitors arrived on my website. OneStat helps me to improve my SEO strategy! OneStat.com is a leading and global provider of real-time web analytics solutions, delivered to customers through hosted, on demand services without costly investments in IT infrastructure. Onestat's market leadership has been demonstrated over the past 6 years as we have helped some of today's largest online businesses and websites like HP, FuijFilm, Thomas Cook, Cornell University, MIT, Dunlop, TUI, CBS, Fonts.com, Trump, Pandora.com and the Emmy Awards. OneStat has more than 75,000 customers across 100 countries. Also, as an online marketer or webmaster, you can benefit from our real-time and independent web analytics services! Increase leads and online sales. Our ecommerce reports will show you the performance of your online sales and registration pages, allow you to analyze the effectiveness of critical processes and improve it based on facts. Improve ROI of marketing campaigns. Track performance of paid or organic search, email, banners and affiliate marketing campaigns to improve the ROI of your marketing budget. 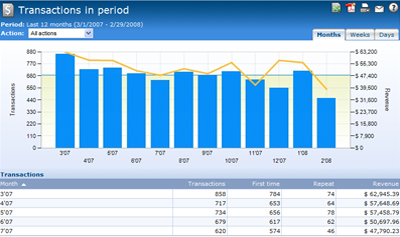 Click fraud detection is included and part of the marketing reports. OneStat can track every website including websites for mobile devices. OneStat has an interactive and pleasant interface which will help you to provide the data you want and need. OneStat is developed with extensive user feedback and the input of industry marketers and consultants. All our reports are based on web 2.0 technology so you can easily drill-down for detailed information or compare time periods with each other. You can also share insight across your organization with OneStat. We can automatically send you, your co-workers or management scheduled email reports in PDF or HTML. You can export and download all the reports into Excel and PDF. OneStat is an independent third party solution and provides reliable information about your visitors, transactions and online marketing campaigns. The results are not biased because we are not part of an advertising network. Because we are an independent third party we provide detailed reports about click fraud which will to increase the ROI of pay per click campaigns. Competitive priced. Free 4 week trial. Signup now. 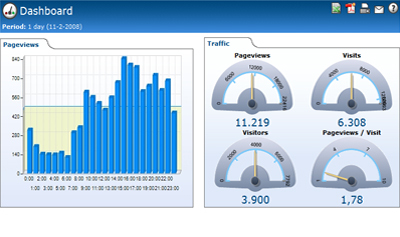 OneStat web site statistics are competitive and flexible priced. Signup for a free 4 week trial and experience our web analytics services so you can improve dramatically the visitor experience, online sales and marketing campaigns. Signup for a free 4 week trial now, click on free trial in the table above.